The average daily traffic to Dot Dot Dot is currently less than half of where things were in April (about 1,500 a day this week; about 4,000 people were stopping each day in April). This kind of thing would probably have depressed me years ago, but I've come to see that things slump off in the summer. And if things don't increase in the fall? I may not be too upset about that, either. As long as this is fun, and I hear from people that they like what they see, I'll keep tapping away. I've been sick the last few days ... another sinus infection. A lot of napping, a lot of flopped out on the couch. When you can't move quickly, you notice small details, and one of them got noticed today while I was powering up the operating system I use for this blog. OK, back to ordinary programming. Or lying about, clutching your forehead, as the case may be. I'm taking a few days off and am not expecting to be able to post anything until Sunday or Monday coming. I finally got around to setting up an account with Empire Avenue, a social networking sort of virtual stock market thing ...I think. Here's where to find me. It was founded by some bright young folks like Duleepa Wijayawardhana, whom I met coming up at the Muse a number of years after me. I've been a sporadic member of another virtual stock exchange, HSX, for 12 years, so adding another fake portfolio seems logical. The idea, as I gather, is to gain value through online influence. We'll see how that goes. And for the purpose of verifying that I do indeed own this blog and can in fact edit it, here's the verification code Empire Avenue asked me to put in a post: 804553654c. Ta da. Well, not necessarily life-changing, but pretty major. I decided to step off the treadmill that is my job at cbc.ca/nl, where I edit the news from CBC in Newfoundland and Labrador. I asked for, and got, an unpaid leave of absence; my last day was July 3, and I'm scheduled to report back early next March. As I've told people, it's a great job; it's just that there's too much job. I'm very grateful I've been given the opportunity to take a break to develop some new skills. What plans do I have? Well, I'm not yet sure. Still figuring that out, although I have some ideas of what I want to try. I want to stretch my creative legs and try some things I haven't done before, as well as master some new skills and return to some types of writing I've enjoyed in the past. Among other things, I'm working for my wife, who runs a successful company from our home. I'm really looking forward to working from home again: I've been self-employed twice during my career, and I have to say they were pretty satisfying periods. Week 1 is drawing to an end, and it was not nearly as productive as I might have hoped. I spent most of it coming down with and then getting over a sinus infection. Nothing like a little kick to the immune system to take the wind out of your sails! I will be keeping Dot Dot Dot running, and indeed will actually have a little more time for it. Anyway, on with the rest of the adventure for the next eight months! Five years ago today, I published the first post on Dot Dot Dot. I didn't have much to say at the time, in retrospect, although at least I got the title right. 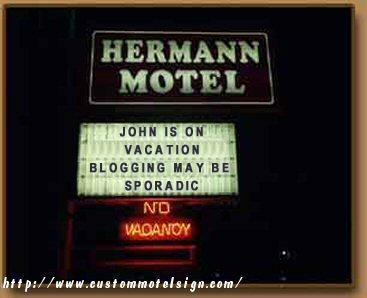 At that point, blogging was not even novel, and I had been toying with the idea of starting a blog. I'm still here, and I notice that many, many of the blogs I used to read then no longer are. My rules haven't changed much. Because I'm a journalist, I can't and won't wade into political issues, and I keep most of my opinions to myself - at least on stuff I may have to write about one day. This is, indeed, really restrictive. So, if I can't deal with all that, there's still plenty else, from my pop-culture diet to my professional interests in journalism (it's in the queue as "craft singles," one of many bad puns I've committed here) to ephemera like T-shirts and found objects. I may get back to incorporating a little more history here. In other words, a whole bunch of dots, sometimes actually connected to each other. I'm battling a nasty infection in the head. Blech. Posting has been a bit erratic lately, but hopefully will get back to normal. A sign that speaks for itself. There'll be a little less frequency in the days in the days ahead.